A Faroese music band came up a great idea of how to celebrate the solar eclipse last Friday - they shot a live music video. For nearly six minutes, viewers saw the world around them darkening and then returning to normal. 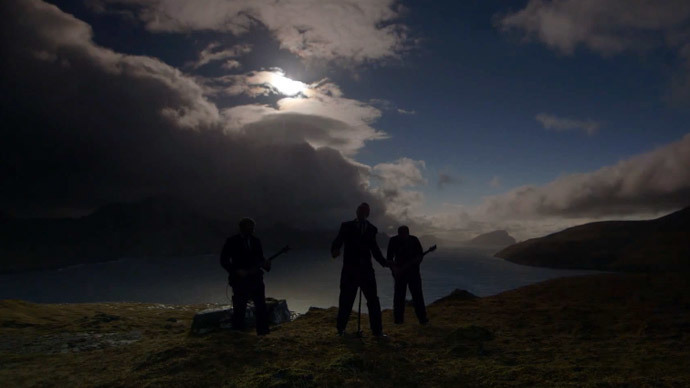 An extraordinary six-and-a-half minute clip shows the Hamferð doom metal band, performing their song Deyðir Varðar with the total solar eclipse creating a dramatic backdrop. Deyðir Varðar means dead beacons. Hamferð, formed in 2008, won a Faroese music prize at the annual Planet Awards in the category Band of the Year 2012. In 2014, they won a Planet Award in the category Best New Band category. The group says the Faroe Islands are a major inspiration for the band. “The sea and the long cold winter play a major role as main inspirations," they said earlier. Gazers across Europe and other parts of the world were awed on Friday by the rare solar eclipse, which coincided with other events such as the spring equinox and a supermoon. Only people in parts of the Artic and northern Europe were lucky enough to witness the eclipse in its totality. But millions saw a partial eclipse in other parts of Europe, North Africa and West Asia.